‘This isn’t some regretful 40-something giving you matronly advice. I spoke to scientists and experts in neurobiology, psychology, sociology, marital research, couple therapists, behavioral economists, regular folks married and single.’ Don’t like what the book is saying? There’s more than Lori Gottlieb to blame. The thing is, what we’re really talking about here is choice, and that, often, because we believe (because we’ve been told) we have so much of it, we operate according to a belief that to settle for anything less than perfection is to sell ourselves short. Of course, we’ve covered the problems with perfection. Namely, that it doesn’t exist, and, therefore, we can waste a lot of time waiting for it. Thing is, though, those words are pretty easy to throw around–we read them, we say them, we hear them, and we agree. Of course perfection doesn’t exist, we say. Only a fool would hold out for perfect. ‘I interviewed a psychologist for MARRY HIM named Barry Schwartz. He’s a professor at Swarthmore and he also wrote a terrific book called THE PARADOX OF CHOICE. We had a long conversation about how having so many choices actually makes people depressed. You’d think it would be liberating–who doesn’t want to have options?–but actually, having so many makes us dizzy with indecision. And when we do make a choice, we second-guess ourselves because we compare it to all the other options that we didn’t choose. The same applies to having so many choices in a potential spouse. 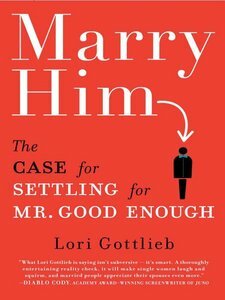 So Schwartz said to me, about the way we choose spouses these days, ‘You have to remember that good enough is good enough.’ And that mantra has helped me and many women I know enjoy the men we meet much more, and also make much better choices out in the dating world. Of course that makes sense. And I like the point. But. Is it a cop-out? It reminds me of the whole Happy Life Or An Interesting One debate, and the question of whether we put too much of a premium on a certain brand of happiness, undervaluing interesting along the way. I guess, as we’ve said before, happiness is really all in how you define it. It makes me think of the movie Parenthood, and the amusement park wisdom from Grandma. On the other hand, that’s Hollywood. But sometimes, Hollywood wisdom is good enough. Wow, I had not yet heard about this book. Seems to me marriage is hard enough without being completely in love with your spouse. If people are not in love when they become legally bound to one another, the chances that marriage will survive are very slim. This seems to me to be the pathway to divorce.